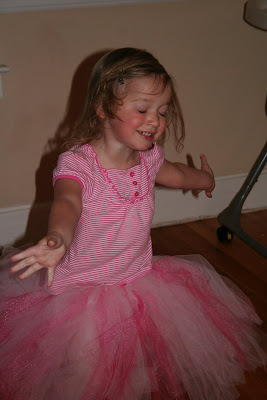 Ever since Wednesday's photo shoot, DeLaynie has been tutu crazy. She enjoyed the experience of the tutu so very much that I came home and made each girl her very own tutu, as I mentioned previously. It was surprisingly easy. I decided to make a little how-to for those who have been hit by the recession (from what I hear, the tutu budget is the first thing cut), and for those who never had such a budget before the recession. If you are not in those categories, or if you don't have two hours (maybe three, or four if you include a little "helper" in the process), you may go here to purchase a better one than you could probably make. A little warning, though: if you're a perfectionist, this may be difficult. If scrapbooking gets you on edge, and you can't imagine a life without a tutu, just buy one. 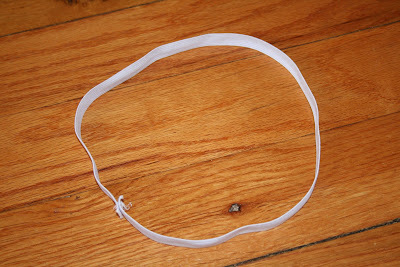 Elastic- I used elastic that was 1/2 inch wide. It worked great. (Again, I found it in the craft department of the local WalMart. $1.18 for way more than I needed for two tutus. Needle and thread, if you don't have any- I did. I didn't have to buy it. One woman used staples, but that wouldn't last six minutes with my girls, and it sounds dangerous. 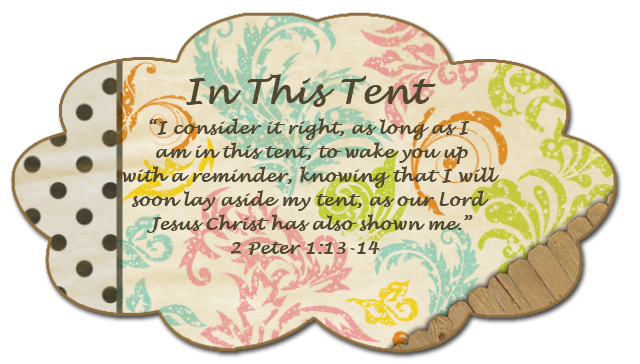 Now, do you have everything together? Good. Let's get started with the fun part. If your daughter is old enough, cooperative enough, and crafty enough, she may want to help. I think that it would be completely possible for a preschooler meeting the qualifications listed to help. Unfortunately, DeLaynie isn't cooperative or crafty most of the time when it comes to my ideas. She's very creative with mud, though. Ella is not old enough, but I have a feeling that this will be right up her alley in a year or two. I was alone in making these tutus. The next step is to start attaching tulle. The way to do this is to double the tulle, place it under the elastic, and pull the ends through the loop that is at the fold. It's like pulling a ponytail through an elastic band, sort of. This is a good place for your daughter to help. She can pull the tulle through. It really isn't that difficult, and perfection isn't nearly as important as the experience (says the woman who made the tutus alone). I tried to draw a diagram of what this looks like, but there really isn't a way for someone so completely inept in all things vaguely similar to drawing to do that. Try to figure it out from this photo. It's completely clear, right? Pretty, eh? I got mine pretty full. Fuller than totally necessary. It stands up on its own, which makes me think about the petticoat that Rhett Butler bought for Mammy (in Gone With The Wind). After I finished all of that, I attached a bow to the front, or back, though it usually ends up being the side when DeLaynie's wearing it. It does look lovely sitting there, doesn't it? But the true test of a tutu's greatness is not how it looks against a wall. It's how the child feels while wearing it. She rarely takes it off. The only occasions she seems to think worthy of its removal are bath time, bed time, and going out. There are exceptions to that last one, too. Today I let her swing with it on. You would've thought she was in Heaven for the giant grin on her face. That is $15 well spent, because Ella enjoys hers, too. It's great to finally find something extremely girly that DeLaynie enjoys. Here are a couple of pictures of the girls enjoying playtime in their tutus, not that I am trying to compete with Samantha. Nope. Not even gonna try. Great tutorial. Now you need to make matching fairy wings. Thank you so much for posting this. I wanted to make a tutu for my little girls first bithday pictures and couldn't figure out how to do it. Thanks again!!!!! Thanks so much for the detailed description of how you made the tutus! Thank you fo these wonderful instructions; I now know what my favorite neice is getting for Christmas. Thanks so much - Haley's tutu looks amazing! Interesting blog you got here. I'd like to read a bit more concerning this matter. Thanks for posting that information. Thankyou so much for the EASY to follow directions! After reading this I went and bought all the things I needed to make my babys first bday tutu. I ended up using 140 yds for two multi colored tutu'S which of course they are so full they stand up on their own! very pretty....perfect for pictures! Thankyou! I am so glad to discover that these instructions have been helpful to wonderful mommies and grandmas! 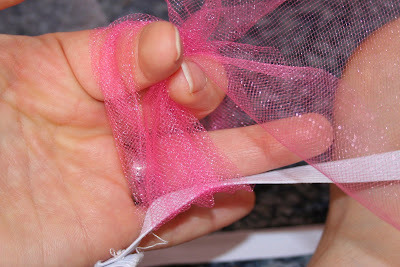 To attach the ribbon, put the ribbon against the elastic when you're attaching the last piece of tulle. 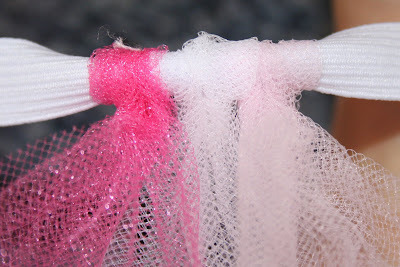 Once you have tightened the tulle, tie the ribbon into a bow and use hot glue or superglue to keep it tied permanently. I had a great time making these with my daughter and a little girl I babysit. My daughter is 4 and the other girl is 6 and they take dance together. They loved them. I added a few more bows and a couple of flowers that I got in the sewing section at walmart. I had a suggestion that might take the prep time down. I am not sure how well it would work though. I saw they sell 6" spools of tulle online at JoAnn Fabrics. It might help. I am going to try it next time. Thank you so much for such great instructions. Oh how I love you!!! I am costuming a show for my college and am running short on time! 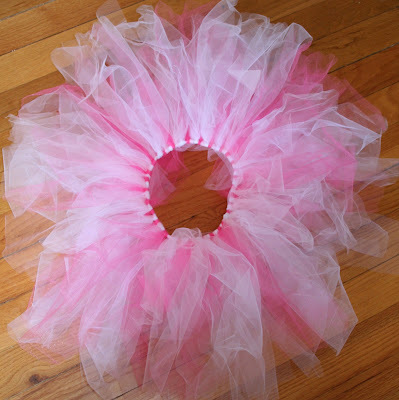 This is a quick and easy solution to creating a tutu for a, well, larger adult. You truly have saved me so much time and effort and I am forever grateful! P.S. I think your way is so creative and lovely I might have to make one for myself... I have always loved tutu's! Thanks again!! Thank you so much for such detailed explanation. 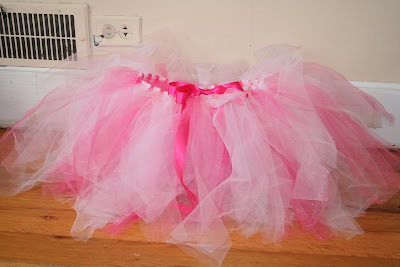 I have never made tutus and a newbie as far as sewing projects go and your instructions were so clear and answered all my questions that I had. I can't wait to make my first tutu tomorrow. Haha, I'm trying to make a tutu for myself..I'm dressing up as Alice in Wonderland for my 23rd birthday...I've been trying to find easy to follow instructions for ages! Thank you! Thanks for the trying idea!!! I was going to sew the tutu for my daughters highschool homecoming! We live in "Friday Night Lights" Texas. It only took us about 40 minutes including all cutting & trying!!!! Thanks again. I so appreciated your pics on how to make a Tutu, I needed one quick and was so glad to see your website....Thank you...Lori. I love this! It seems so simple. I am going to make one for my daughter and one for my niece who is yet to be born :) She should be here in September. I can not wait!! Hi there! I just made a ladybug tutu for my daughter using your instructions. It was so easy and quick! Thank you! YAY! My little girl LOVES her tutu. Thanks so much for the instructions. I'm ready to make the next one!!! Oh...and YES, 6 yards is plenty. Her tutu is HUGE! I doubt she can sit down in the thing. I but my tulle in spools that are 6in wide and 25yds, around $3. I recently made 3 with a solid and glittered for a friends flower girls in her wedding, gorgeous. That's really cute!...n your girls lk lke they luv them :) gd job!